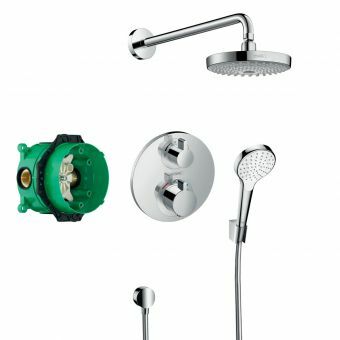 Hansgrohe Croma 100 Shower Sets, Ecostat Comfort CombiFrom £172.25 inc.VATRRP: £265.00 (Save 35%)Could this be the perfect family bathroom shower set? With 3 spray settings and a safety stop valve - excellent value! The shower is something that most of us use every day. Whatever time you like to use the shower, it’s one of those things that should be considered carefully before replacing, as anything that you use so often is worth investing in. What should my shower look like? There are so many types of shower available these days that there should be something to please all tastes. You may want to look at exposed versus concealed showers, for example. An exposed shower means that you can see most of the pipes, valve and more. 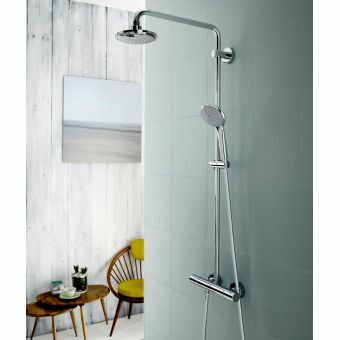 This may sound messy, but there are very stylish exposed showers which will really make a statement about the design of your bathroom. 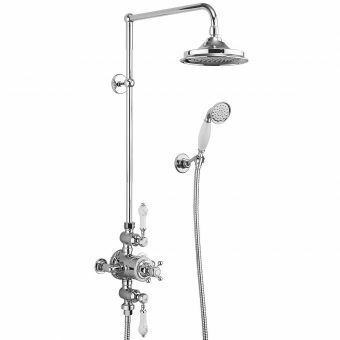 Imperial offer an impressive Victorian style showerhead and taps with an exposed valve. 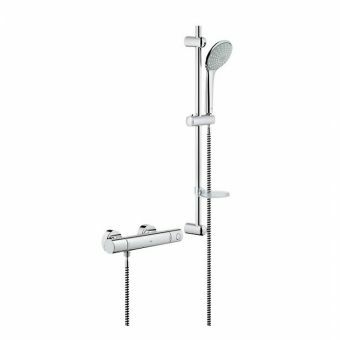 A concealed one, such as this Burlington Trent Concealed shower kit, really gives a very minimal and stylish look and the valve sits behind the shower wall. 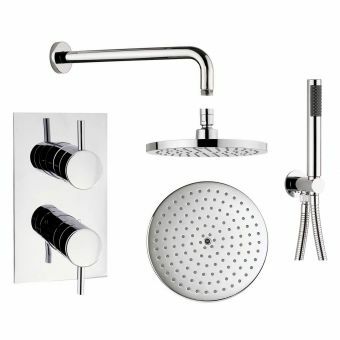 Depending on your home or bathroom and chosen style, you will want to decide whether you want a traditional or contemporary shower. 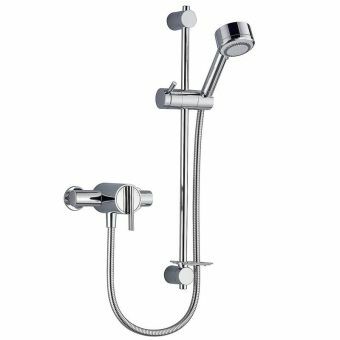 Both the previous examples are more traditional in the style of the brassware, but there is no compromise with functionality when choosing a traditional tap and showerhead. 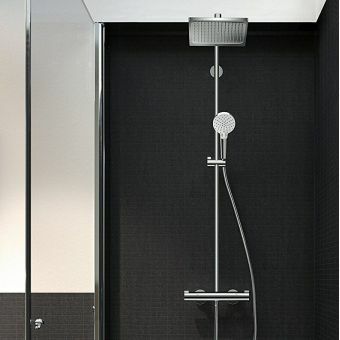 For those of you seeking something more contemporary then there are, again, hundreds of choices, but this Mira shower is minimal, chrome, bold and ultra-modern. 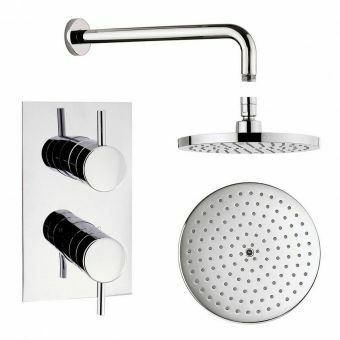 The choice between a traditional or contemporary style of shower really is down to your personal preference and approach to interior design, both will be offered to suit your shower needs. It’s worth thinking about who uses the shower in the particular bathroom for which you are buying. 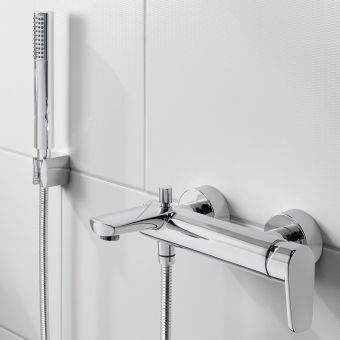 If it’s the en-suite to the master bedroom then you can probably get away with a fixed shower – although if there is a height difference or if you live in an older house with tall rooms, do consider carefully where you place a fixed head. 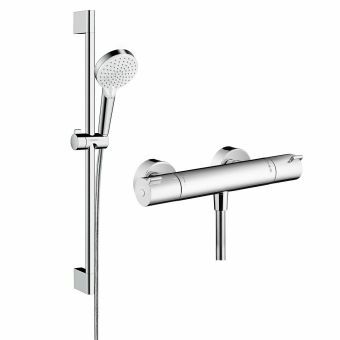 Fixed shower heads are very much in fashion at the moment and they do look great, with many claiming that they ‘feel like rain’. 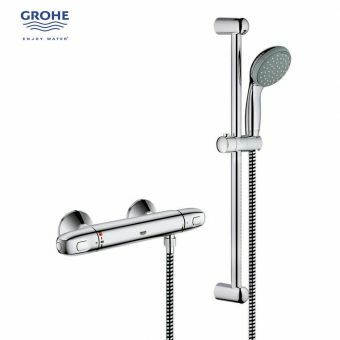 The Grohe 3000 Rainshower is a fixed and concealed shower that is also very minimal. 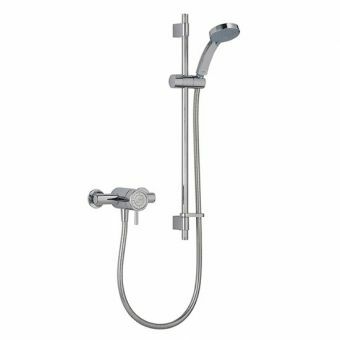 However, if you want to rinse yourself or the shower with more flexibility, you may want to consider the same shower but with a handset pack. If you have a family then you can use the handset to rinse the kids’ hair or, if you hate spending lots of time on cleaning and want some ease then it’s also useful for rinsing down your shower cubicle or bath. Another option is to have both a fixed and handset with a rail and then have a diverter to send the water to the one you want to use. 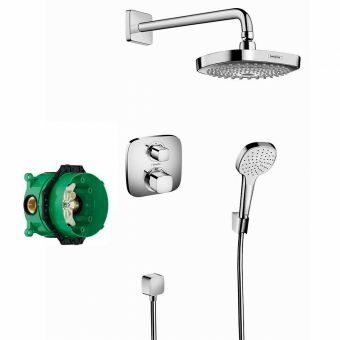 These operate just as those used on a bath and shower, sending the water to the correct outlet. This allows you to have the best of both worlds. 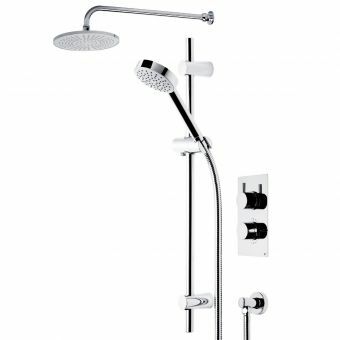 For a simple, more flexible, single shower, which caters to all different heights, a handset with a rail is a perfect option. 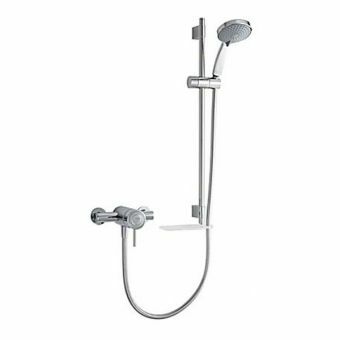 You can have a traditional or a contemporary shower head and taps and the rail allows you to adjust it for the person using the shower. 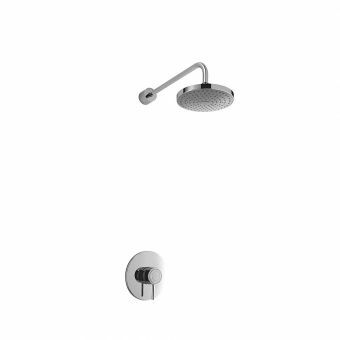 There are a plethora of showers like this available and this Aqualisa model is simple and attractive and digital – leading on to…. These are the three mixer options to manage the temperature of your water. 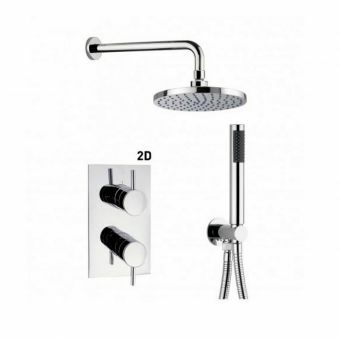 A manual shower mixer requires that you set the temperature of the water by adjusting a valve. Hot and cold water supplies are fed to the respective taps and you adjust the valve to let more or less hot and cold water through to find the temperature you want. 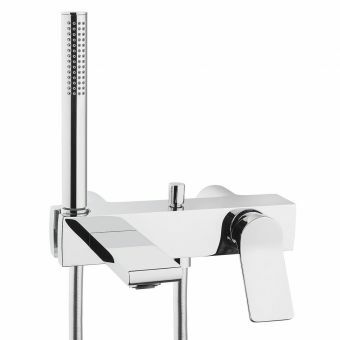 Manual mixers are common and in some cases, they are the only option as low-pressure water areas don’t support thermostatic showers unless you install a shower pump. 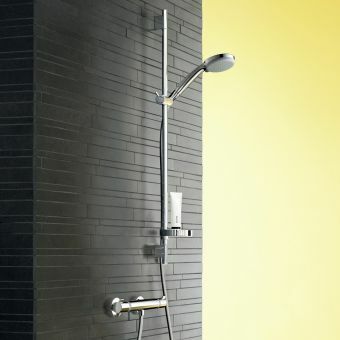 Thermostatic showers tend to be more expensive but are well worth the investment. You can set the temperature of your shower and that will be maintained throughout your shower, even if someone puts it in the washing machine and is running the taps to wash the dishes at the same time. 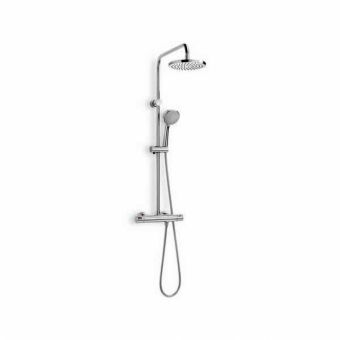 A thermostatic shower mixes the hot and cold to a pre-set temperature, so you know how the water will feel when you enter the shower; it also protects you from scalding water by closing the shower off completely if the cold water fails. In our digital age, it’s no surprise that showers can be digital, too. 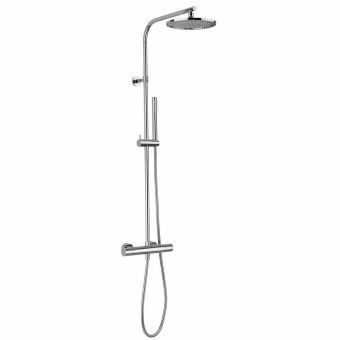 Like thermostatic showers, you can select the temperature and the shower will be at a steady temperature for the duration of use. 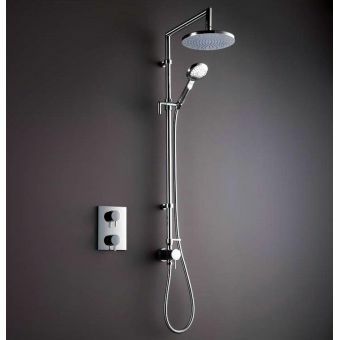 You can wait to get in the shower when the desired temperature has been reached, as this will be displayed on a LED display. You don’t have to be in the shower to operate it either, you can have the control on the bathroom wall, for example, and set it to come on and arrive at the right temperature while you do something else – great for those busy mornings of multi-tasking while getting ready for work, school and everything else. 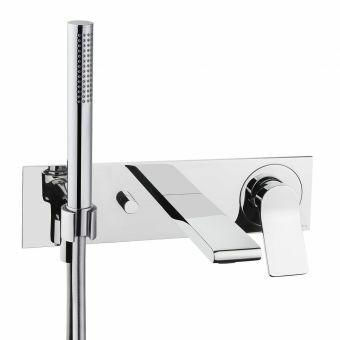 Aqualisa lays claim to have designed and launched the first digital showers in 2001, although many other shower designers and manufacturers have quickly developed their brands too. 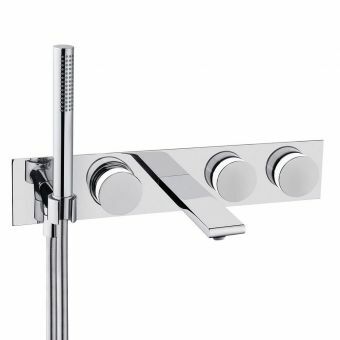 We recommend that you think about what you want and what suits you and then you can search for the model and style to suit your home and shower users. It's important to know whether you have high or low water pressure and to select a shower suited to that water pressure. Matching the right shower to your water pressure will ensure great results; get it wrong and you could end up with hot and cold water with different flow rates, making it difficult to control the temperature and slow running water. A water pressure system is composed of a combination of a boiler and water storage tanks. If you do not have a boiler, you will have hot and/or cold water tanks. Others just have a boiler; all of this depends on the age of your home and when you had your heating and water system installed. 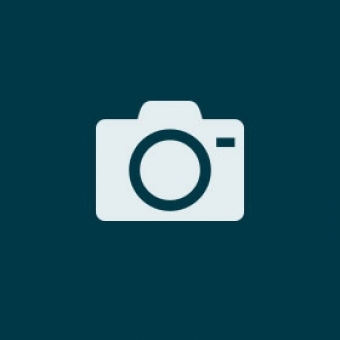 You may completely overhaul the system you have, or work with the existing components. If you have a cold water tank in the loft and a hot water cylinder somewhere in your property, then you have a low-pressure system. 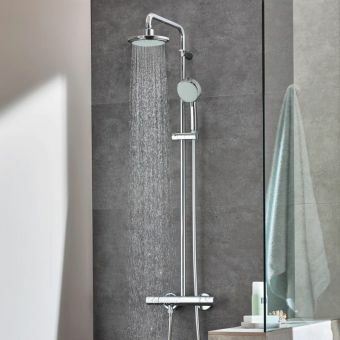 You should choose a shower that is designed to suit low water pressure and calculating the exact pressure will help deliver a better performance from your shower. Low pressure is classified as anything below one bar. If you have low water pressure, you will have a more limited range of showers to choose from but you will be able to find a good shower to suit your home. It is possible to fit a pump to boost the water pressure, both across the house or just for the shower. If you have a combination (combi) boiler then you have high water pressure. A combi boiler is usually mounted on the wall in the kitchen and you won’t have hot or cold water tanks. 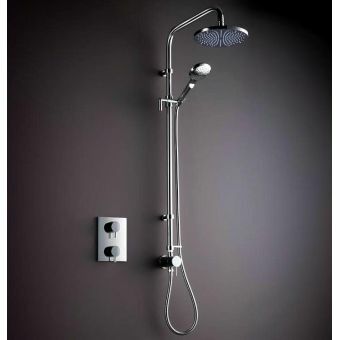 Most showers will be suitable for use with this system and you will have a lot of choice of showers. If you only have a hot water tank, you also have high water pressure and will find that most showers are compatible for use in your home. 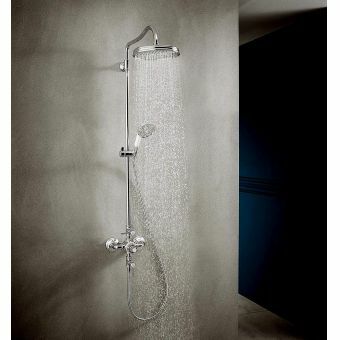 If you are looking for something extra special, like this Swadling shower with six body jets. 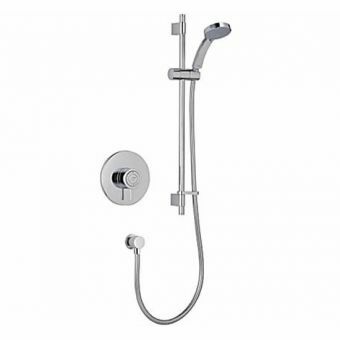 The shower head also has different settings allowing for stronger jets of water or a traditional shower. 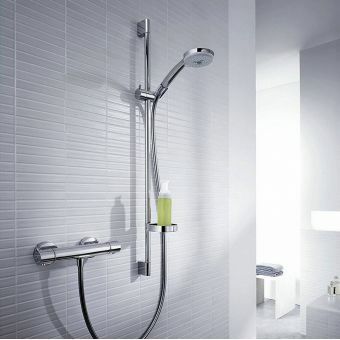 Shower columns are a simple way to introduce the luxury of body spray features, this Hansgrohe column, for example, gives additional jets and is height adjustable. 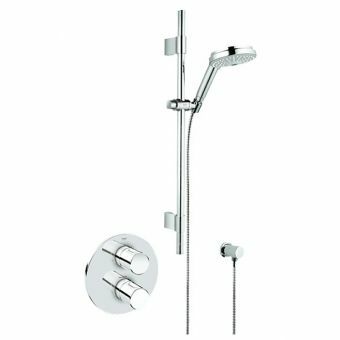 They also have quite a minimal look and are a good option if you don’t want an exposed shower but are unable to fit a concealed system. With a shower being one of the most used appliances in the home – four people may each use the shower one or more times a day but the oven may just be used once for the family evening meal – it really is something worth researching and getting right for you and your household. All of the brands that we offer are carefully chosen based on their value for money and quality. 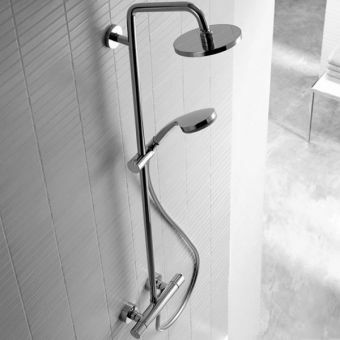 We stock a range of showers to suit lots of budgets but always with quality and longevity in mind. We work with suppliers that have the confidence in their product and offer warranties to reflect that. So there you have it. There may be more to consider than you originally thought when installing a new shower but there are so many options available that it is worth researching what you can have and make sure that you find a shower that performs to your needs. You may want some additional features to make your mornings brighter or to add massage jet after sport. 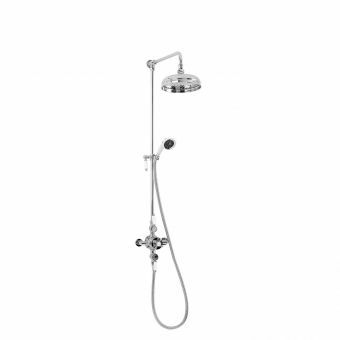 Water pressure and design are also factors in your decision but we are confident that we have the shower for you from the best suppliers in the business.